I have previously noted in this blog that the first two published phylogenetic networks (by Buffon in 1755 and Duchesne in 1766) were hybridization networks. This leads to the obvious question: what was the first phylogenetic network illustrating horizontal gene transfer (HGT)? However, if we consider HGT to be a subset of genome transfer (or genome fusion), which is the horizontal transfer of an entire organismal genome, then a much earlier date becomes possible. This is because the idea of endosymbiosis, which posits eukaryote organelles as the acquisition of different bacterial genomes, dates back more than a century. 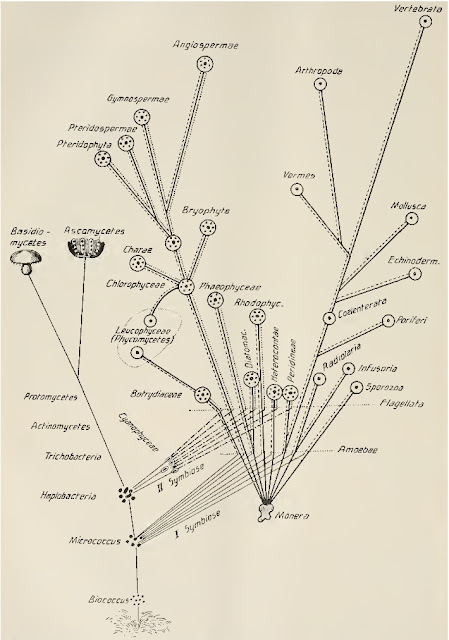 For example, Constantin Mereschkowsky (1905) developed his symbiogenesis theory with the explicit goal of explaining the evolutionary development of land plants from algae-like forms of life, postulating that chloroplasts originated as symbiotic blue-green algae. Richard Altman (1890) had already proposed (indirectly) that what we now call mitochondria are also symbionts. 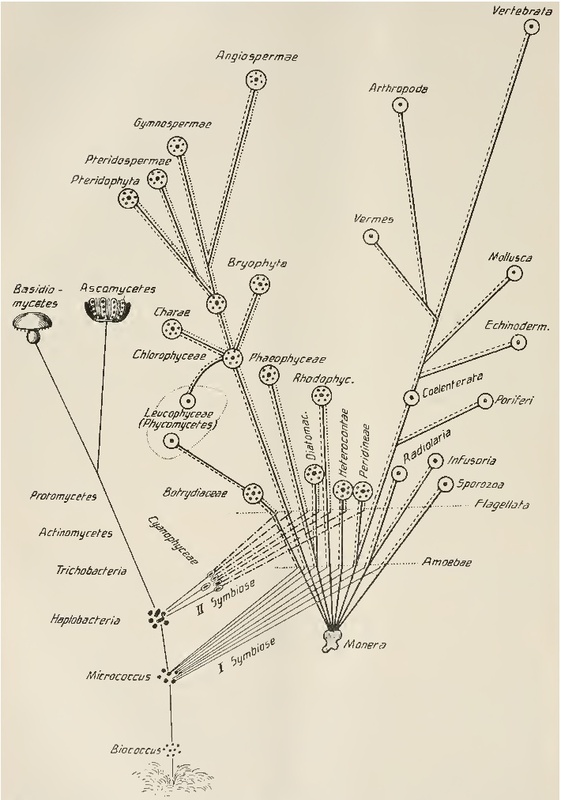 Mereschkowsky (1910) then took this idea further, and developed a scenario for the origin of the nucleus and cytoplasm from two kinds of organisms and two kinds of protoplasm, called mycoplasm and amoeboplasm. Each kind of protoplasm had an origin in different historical epochs. He illustrated this two-stage symbiosis idea with an explicit network, which appears on page 366 of his paper. Mereschkowsky's own interpretation of this diagram as a genome-transfer network thus seems clear enough, even though he makes no explicit reference to a genome. Altman R. (1890) Die Elementarorganismen und ihre Beziehungen zu den Zellen. Veit, Leipzig. Freeman V.J. (1951) Studies on the virulence of bacteriophage-infected strains of Corynebacterium diphtheriae. Journal of Bacteriology 61: 675–688. Mereschkowsky C. (1905) Über Natur und Ursprung der Chromatophoren im Pflanzenreiche. Biologisches Centralblatt 25: 593–604. Mereschkowsky C. (1910) Theorie der zwei Plasmaarten als Grundlage der Symbiogenese, einer neuen Lehre von der Entstehung der Organismen. Biologisches Centralblatt 30: 278–303, 321–347, 353–367.